SELINSGROVE, Pa. (April 14, 2018) — Defending 360 sprint car champion Davie Franek, 31, of Wantage, N.J., drove to a convincing victory in Saturday night’s #WideOpen2018 25-lap season opener at Selinsgrove Speedway at the wheel of the family-owned Franek Auto Sales No. 28F. 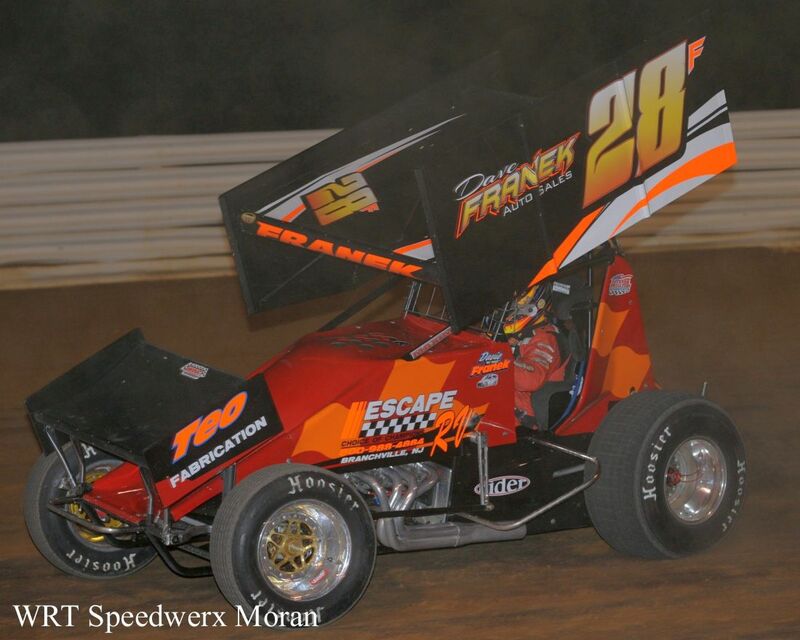 The $2,000 win was the 15th of Franek’s sprint car racing career at Selinsgrove, where he got his start at the age of 17. The 360 sprint car main event almost went non-stop on the smooth red-clay surface until a caution flag on the final lap regrouped the field and set up a chase to the checkered flag between Franek and Mark Smith of Sunbury. In the 20-lap limited late model race, Jeremy Ohl of Mill Hall bested a strong field of 27 entries and steered clear of a multi-car frontstretch melee for his first career win at Selinsgrove worth $1,000. Tommy Slanker of York also began his title defense by capturing the thrilling 15-lap pro stock opener with a pass by Kyle Bachman of Selinsgrove on the final lap. Fans were treated to another last-lap pass in the 12-lap roadrunner race in which Ryan Zook of Mifflintown slipped by defending champion Keith Bissinger of Orangeville racing off turn four for the checkered flag. Randy Minich of Newville wrapped up the evening’s racing with a win in the 15-lap Penn Mar Vintage Race Club feature. A strong field of race cars and large crowd were on hand to kick off the historic 56th consecutive season of auto racing at the Snyder County half-mile oval. During the off-season, the pit area was relocated from inside the speedway to outside of Turn 4 to give fans an unobstructed, wide open view of the racing action. The four-acre, $100,000-plus renovation project is the speedway’s biggest and most applauded change since opening in 1946. Selinsgrove Speedway will present the Ray Tilley Classic for 410 sprint cars at 6 p.m. Sunday, April 22, sponsored by Icon Legacy Custom Modular Homes. The 30-lap tribute race will pay $4,088 to win and $400 to start. The pro stocks and roadrunners will round out the three-division racing card. Pit gates will open at 3 p.m. with grandstand gates at 4 p.m. There will be no racing Saturday, April 21. Outside front row starter Davie “No Panic” Franek powered into the lead at the drop of the green flag in the sprint car main event. Franek was trailed by fourth-place starter Kevin Nagy for the first lap until polesitter Ryan Kissinger moved into second. By lap four, seventh-place starter Mark Smith was challenging eighth-place starter Derek Locke for the fifth position. Five laps later, Smith drove around third-place starter Troy Betts for fourth and the next lap it was Nagy for third. At the halfway point, Franek stretched his lead to a straightaway and the leaders began to encounter slower traffic. With five laps remaining, Franek held a commanding lead over Kissinger, Smith, Betts, and Nagy. On the final lap, the caution flag slowed the field for the first and only time when Nagy spun in turns three and four. Smith took a shot at Franek in the chase to the checkered flag but came up just .28 of a second short at the line. Franek was victorious over Smith, Kissinger, Betts, and ninth-place starter Chad Layton. At the start of the limited late model feature, a three-wide race for the lead into the first turn unfolded with third-place starter Jeremy Ohl powering into the front spot out of turn two. Ohl was chased by polesitter Jared Fulkroad and fourth-place starter Danny Snyder. On the second circuit, a car near mid-pack slowed and caused a chain-reaction crash in which Doug Ishler’s car barrel rolled at the end of the frontstretch. A total of 10 cars was involved in the melee and all the drivers escaped injury. When the green flag unfurled, the rest of the race went without incident. Fulkroad reeled in Ohler in the final laps to no avail. At the checkered flag, Ohler posted a two-second margin of victory over Fulkroad, Travis Mease, Danny Snyder, and Kenny Yoder. Kyle Bachman drove into the lead from his front row starting spot in the pro stock feature. He was closely followed by third-place starter and defending champion Tommy Slanker while sixth-place starter Brandon Moser settled into third. Despite some early race cautions, Bachman held off Slanker’s challenges for the front spot until the final five laps when Slanker moved into striking distance. For three full laps, Bachman and Slanker raced side by side in the stock car thriller. On the final lap, Bachman slipped high in turns one and two and gave Slanker just enough edge to pull ahead in the dash to the finish. Slanker’s margin of victory was just .53 of a second over Bachman, Moser, Shaun Lawton, and AJ Hoffman. Polesitter Will Brunson and third-place starter Keith Bissinger dueled for the early lead in the roadrunner race. Bissinger ran his trademark high line around the big half-mile while Brunson maintained an edge using the inside line. On the ninth circuit, eighth-place starter Ryan Zook showed a lot of speed and got by Brunson for the runner up spot. Zook set his sites on Bissinger and racing off the fourth turn for the checkered flag made a dive to the bottom of the race track to pass Bissinger for the win by the slimmest of margins. Bissinger settled for second with Brunson, Jake Jones and Smith Cope rounding out the top five. Second-place starter Randy Minich took the lead away from polesitter Glenn Roberts on the eighth lap to score the victory in the 15-lap Penn Mar Vintage Race Car Club feature.